The modern era of artificial limbs began with the famous French surgeon Ambroise Paré (1517-1590; considered the "father of modern surgery"). Pare began his career as a barber-surgeon; in 1536 he became a battlefield surgeon. On the battleground his greatest challenge was developing ways to deal with gunshot wounds. The devastating nature of these wounds meant that soldiers' limbs often had to be amputated. 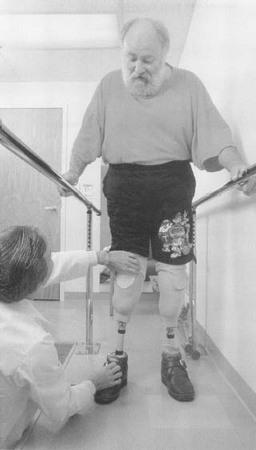 After devising safer, more effective methods of amputation, Pare turned his attention to the design of artificial limbs to replace the ones he had surgically removed. Paré exercised great ingenuity in his designs, always striving to simulate some degree of natural movement in his mechanical devices. An artificial leg pictured in Pare's Oeuvres ("Works") of 1575 featured a movable knee joint controlled by a string and a flexible foot operated with a strong spring. An artificial hand made by Pare had fingers that moved individually by means of tiny internal cogs and levers. When amputating a limb, Pare tried to leave enough stump so that it could be fitted with an artificial limb. Because of Pare's eminence, his ideas and designs for prostheses (plural of the word prosthesis), or artificial limbs, became well known. Significant improvements were made in prosthetic design with the birth in the early 1960s of "thalidomide babies." These children were born with a variety of congenital (resulting from problems that occur while a baby grows in the womb) defects, including shortened or misformed limbs. The defects were caused when pregnant women took the drug thalidomide for relief of nausea and vomiting during the early months of a pregnancy. Artificial arms powered by carbon dioxide gas were eventually developed for these children. In the 1960s scientists in the former Soviet Union formed a prosthetic hand controlled by normal nerve impulses from the brain (the messages were picked up by electronic devices in the hand). More recently American scientists developed myoelectric ("myo" means muscle) prostheses. A myoelectric limb moves when it receives electrical impulses from nerves in the stump of the limb. Modern artificial limbs take advantage of plastics and fiberglass for enhanced strength and comfort. Joints represent a special challenge for replacement. A joint is the place at which two bones come together, such as at the knee or shoulder. Replacement of joints began in the 1950s. Surgically installing artificial substitutes for joints that have become degenerated by disease, injury, or malformation is called total joint arthroplasty. Replacement of the hip and knee account for 80 to 90 percent of these operations. Other less frequently replaced joints are the shoulder, elbow, and small joints of the hands and fingers. The first total knee arthroplasty was performed in 1951; ten years later the first total hip replacement occurred. Artificial joints are fastened to the bone either by cement or by a relatively new process called "bone ingrowth" in which the natural bone grows into the porous (full of small holes) surface of the prosthesis. Still, cementing is the favored technique for older patients. Some evidence claims that patients who get bone ingrowth replacement experience longer wear (more time before the artificial joint begins to wear out) than recipients of cemented joints. Artificial joint recipients must watch for signs of infection. Newer surgical techniques, including super-sterile operating rooms, are helping to minimize the risk of infection. Joint replacement does not usually restore normal function completely (for example, the replacement joint is not usually as flexible as the natural joint, and certain types of strenuous activities are limited). Nevertheless, joint replacement usually restores significant mobility and dramatically relieves the pain of problem joints. About 4 million people in America have artificial limbs. I saw a man was having an artificial electronic hand. may I get the information abut him And about that electronic hand (that was working like natural hand). our child has undeveloped lower spinal cord which has resulted in a big unhealed sour on his back since birth. A shunt was also inserted to drain the secretions from head to stomach. His legs have grown but he does not feel anything on them. Moreover, his feet have remained the same size since birth. That this child falls under 'Thalidomide Babies' category. If so, what can be done to make him walk and what will it cost. I would like to know if any joint replacement part is made of fiberglass and what happens when this part deteriorates and gets into the blood stream. Need to know if any advandced surgery is there for new born who is born with only 2 finger, middle 3 fingers missing, any advanced treatment for adding fingers could be artifical or real kind pls revert. My Husband lost his leg in 2004, has not been able to walk.It is above the knee .Is there any way they can replace a hole leg? Actually my father's ankle has been moved down to bottom, and from inside the ankle is severely damaged and above all he has diabetes. I have consulted with many different doctors and most of them said there is only one thing which can be done, to remove the damaged foot. Can you tell me about joint replacement if possible. I need information for my friend who lost his one hand in a car accident. He needs a electronic hand only that has five working fingers that give good grip to pick things. I ones saw a man with an artificial leg also with wheels under it.